What Is an "img" Tag/Element? "img" elements are inline elements. A "img" element must have empty content. A "img" element requires an attribute called "src" to specify the URL of the image file. A "img" element requires an attribute called "alt" to specify the name of the image. A "img" element will cause browsers to fetch the image, and displayed it inline in a paragraph block. 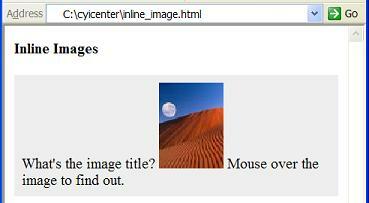 The image name will be displayed when users mouse over the image. What Are the Attributes of an "img" Element? How To Reduce the Display Size of an Image? How To Float an Image to the Right Side? What Is an Animated Image? What Is a Server-Side Image Map? What Is a Client-Side Image Map? What Is a "map" Tag/Element?